These are poems of tribute and sympathy for the Charlie Hebdo cartoonists and their co-workers who were murdered by terrorists in Paris, France on January 7, 2015. We have also included heretical poems, cartoons, quips, quotes and epigrams we think they might have appreciated, since they were anti-religion and accused of "blasphemy." We also remember and honor Ahmed Merabet, the Muslim police officer who was shot dead in cold blood as he lay wounded in the street. 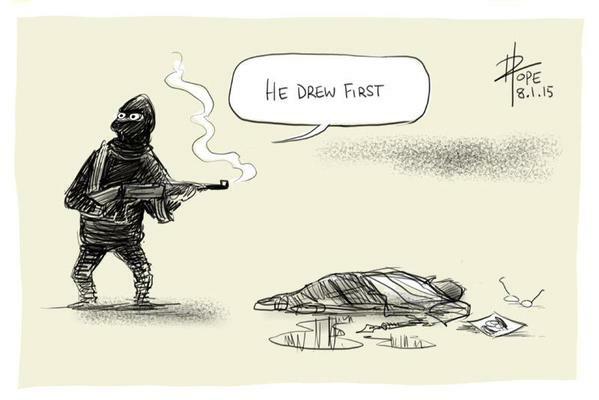 The cartoon above was created by David Pope, a political cartoonist for Australia's Canberra Times. Within a few hours the cartoon had gone viral on social media, with more than 60,000 tweets and 30,000 favorites. "It just hit a nerve," according to Pope. Also within a few hours, the hashtag #JeSuisCharlie ("I am Charlie") had eclipsed other internet memes to become an expression of global solidarity with the murdered cartoonists. But let's be honest and admit that most of the world did not risk death by directly confronting Islamic extremists in a duel of pens versus assault weapons. Charlie possessed a rare courage and refused to be intimidated or silenced. Most of us are not that brave, nor that defiant. that you perished for humor. are all carefully worded to avoid the next blow. The fortune to which you rose heir. Fresh wonders when the flesh turns cold. Deny earth feeds on them and you. I refuse to accept the view that mankind is so tragically bound to the starless midnight of racism and war that the bright daybreak of peace and brotherhood can never become a reality ... I believe that unarmed truth and unconditional love will have the final word.—Dr. Martin Luther King, Jr.
don’t bring me toys, or games, or candy . . .
just . . . Santa, please . . .
I’m on my knees! . . .
please — don’t let Jesus torture Gandhi! gimME that ol’ time religion! jesus loves and understands ME! the alky, the druggie, all queers short and tall! ’cause fiddle-dee-DUMB, fiddle-dee-WEEEEEEEEEEEEEEEEee . . .